All parties summoned by the Panj Pyareh, including the owner of the Moshi-Moshi Kuala Lumpur night club, have acknowledged their respective mistakes in the case where Sri Guru Granth Sahib (SGGS) was brought to the club in Kuala Lumpur. Also acknowledging his mistake was renown raagi Sarabjit Singh Rangila Durgwale, who did kirtan at the night club, which he had earlier said was an oversight on his part. The Panj Pyareh have also decided to come up with a framework for a so-called Sri Guru Granth Sahib Satkaar Committee to be established in all gurdwaras. Satkaar means respect. 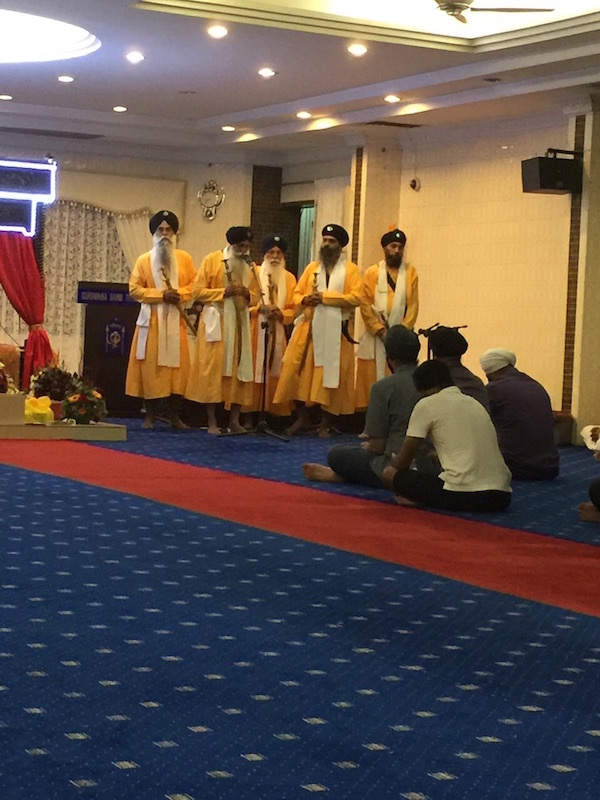 In a proceeding in Kuala Lumpur held late evening today (Jan 5, 2015), the mood was tense, but the Panj Pyareh established by four Sikh Malaysian-based Sikh organisations is believed to have been able bring the matter to a close. IN SESSION: The Panj Pyareh entrusted to resolve the Moshi-Moshi night club prayer fiasco. In the incident on Sunday, reported by Asia Samachar here, Malaysian Sikhs took to the social media to show their unhappiness when word got around that the SGGS saroop, obtained form the Gurdwara Sahib Titiwangsa, was taken to the night club for a prayer session. Within hours, photos of the event began making their rounds on Facebook and WhatsApp, with a large majority, including self-avowed pub-goers, condemning the action of bringing the SGGS to the night club. In the aftermath, a meeting was held at 2pm today (Jan 5) involving the Titiwangsa gurdwara and four Sikhi-parchaar related organisations – Sikh Naujawan Sabha Malaysia (SNSM), Malaysian Gurdwaras Council (MGC), Sant Attar Singh Ji Brahm Vidya Niketan Malaysia (Niketan) and Sri Guru Granth Sahib Ji Academy (SGGS Academy). The meeting unanimously decided that ‘it was best for the Panj Pyareh to summon the relevant persons’ to appear at the evening meeting ‘to hear the case and decide accordingly’, according to an earlier joint statement from the organisations. At the close, the Panj Pyareh instructed the night club owner, Sukhwinder Singh Bedi, among others, to do one akhand path and do other sewa, including jorey sewa (cleaning of shoes). The raagis involved in the incident were asked to additional path daily for 40 days and some sewa. The whole issue is floored.The panj paire lacked understanding of teh maryada.The panj Piara cannot summon any patit Sikh.The sole reponsibilities lies with the commitee among who is a christian and the ragi.At 65 the ragi should know himself along with his group and the other two ragis and granthi.They closed an eye, but this time got caught out.ONLy the Sikhs practicing the religion can be invited to be made “tan khaiyas”, if their transgressio9ns are proved.The club owner should have been handled through legal channels.In India they use section 44/police section to arrest any patit for insulting Sikh ethos/religion.Sikhs shsould have made reporst in this instance en masse to have action against the club owner. As pointed out by some very wise soul – punishments of doing extra banis is like forcing a drunkard to drink more alcohol. In this sense, therefore, the best punishment for the pub owner is to force him to partake of amrit! Also as rightly pointed out – a ‘gurdwara commmittee’ allows the Guru Granth Sahib to be used, so how come Ragi Sarabjit Singh Rangilais is made the scapegoat??? Smells of double standards here. gurfateh. meat is allowed as per sikh rehat maryada published by the Akal takhat. period. meat is not served in gurdwara because its a public place – people of all denominations races religions are welcome to eat guru ka langgar – hence the vegetables only rule. nothing to do with meat not allowed . only hallal is banned as its sacrificial meat. alcohol is banned specifically in sggs and srm. so no two questions about that.period. genuine satkaar is in the heart- to follow what the guru says..not ceremonial bowing and all that to the sggs as a moortee..or walking circles around it eyes closed but hearts sealed..
but the “punishemnt” is a joke – its like the restaurant catching the fellow who didnt pay the bill….and his punishment is he will eat free food for 40 days….or the drunkard caught..he will be supplied free alcohol for 40 days….reading/listening gurbani is daily discipline of a sikh..how can it be also a punishment.period. Singh kl..let’s not talk about individuals here… What u do in ur home is ur problem n on your conscious..